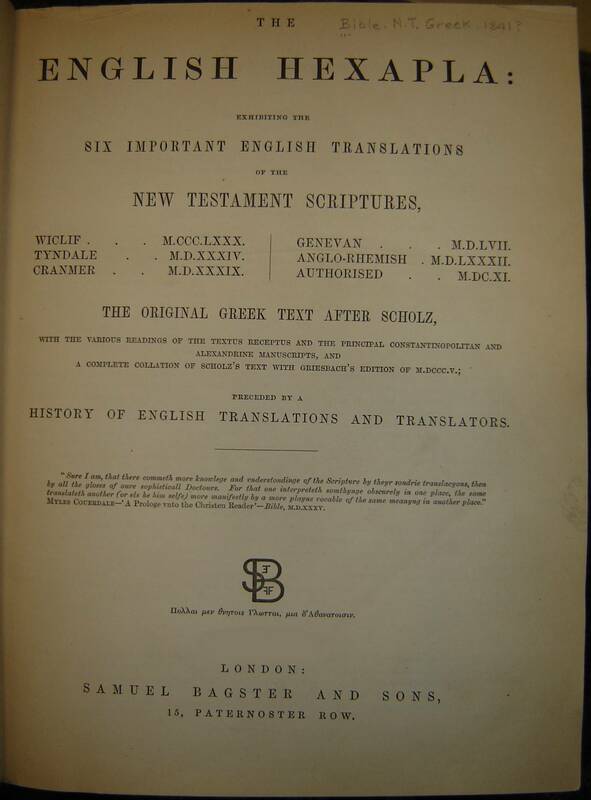 This volume contains the New Testament in six important translations. They are John Wycliffe's translation from 1380, William Tyndale from 1534, the Great Bible from 1539, the Geneva version of William Whittingham from 1557, The Rheims from 1582 and the King James or Authorised from 1611. 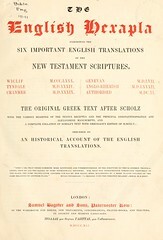 Each double page contains the Greek text at the head of the page and the six translations in parallel columns underneath. The individual versions are not facsimiles but use original spelling. 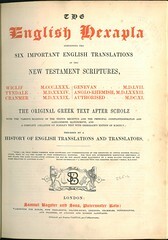 The English Hexapla was published in 1841 by S. Bagster and Sons (Herbert 1840). The first edition contained a long introduction, "An Historical Account of the English Translations", (160 pages) which was written by S.P. Tregelles. 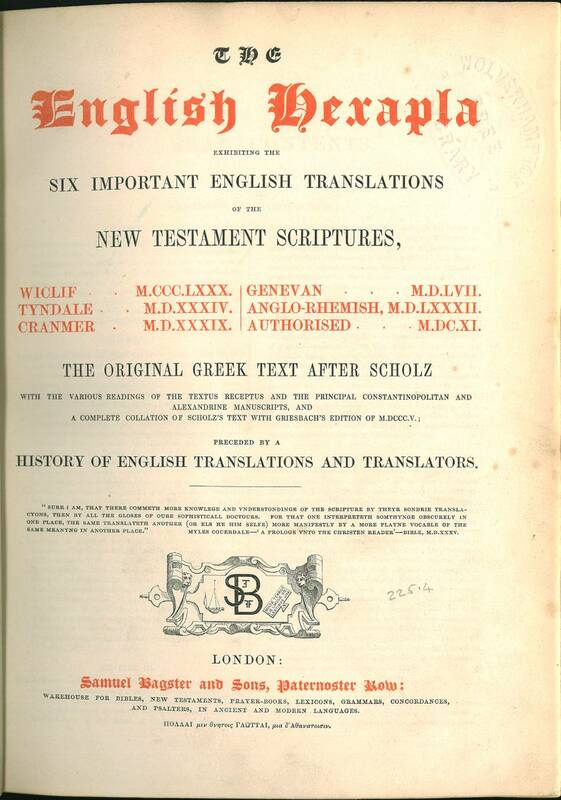 This edition was printed by Wertheimer and Co. Other editions omit the 'Historical Account' and have either a long (112 pages) or short (60 pages) section entitled "A History of English Translations and Translators" "perhaps" by John Stoughton. 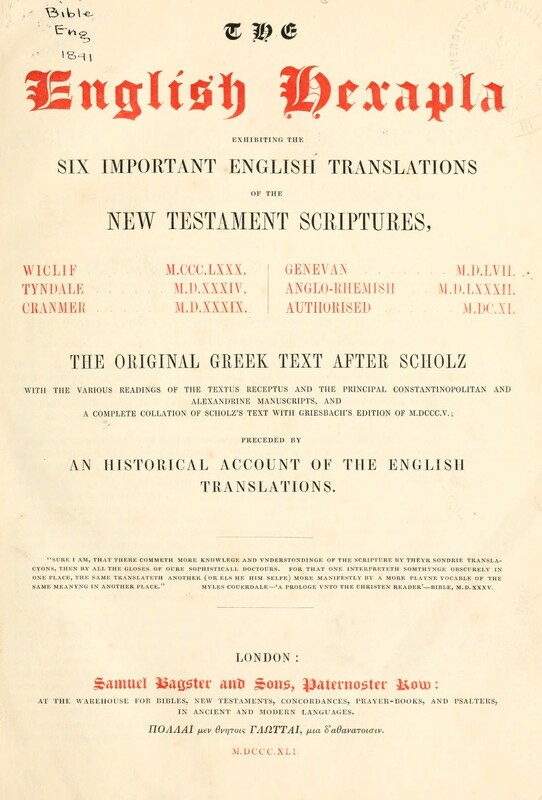 Images: Title page (from the online pdf). Facsimile: A pdf facsimile of the Toronto library's copy is available at the Internet Archive Digital Library. Comments: The pdf appears to be a scan of the first edition of 1841. It contains the full 160 page introduction. Comments: This is not a first edition because it contains the 112 page introduction. It is perhaps an early edition indicated by the ornate title page and the colophon indicating it was printed by Bagster by Wertheimer and Co. Comments: This is probably a later edition indicated by the less ornate title page and also by the fact that it contains the 60 page introduction. 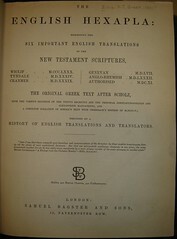 This edition is completely undated and does not contain a colophon indicating the acual printer. The text section appears to be identical to the edition above.